Announcing a seal handbook revision - Kalsi Engineering, Inc.
Our online seal handbook consists of individually revisable chapters, to facilitate updating, and to minimize file size. The handbook has now been updated to revision level 20. The main reason for this revision was to update Chapter D17 to describe a much simpler floating backup ring design. This new arrangement uses simple stacked housings that are much easier to assemble, and considerably less expensive to manufacture, compared to the original cartridge-based design. The design is also more robust, because it entirely eliminates the use of O-rings, which were the weakest point of the cartridge-based design. We believe the stacked housing arrangement is the best way to implement Kalsi Seals in extreme high pressure equipment, such as high pressure washpipe assemblies, rotating control devices (RCDs), hydraulic swivels, and side port cement swivels. Section E shows how to use the stacked housing arrangement in high pressure side port swivels and washpipe assemblies. Handbook revision 20 also includes updates to Chapters, C1, C13, C14, D1, D2, D6, D12, D19, and Appendices 1 and 3. These updates range from substantive technical changes to changes that are purely cosmetic or editorial in nature. For example, Chapter D12 now includes test data illustrating why we recommend against using grease with typical elastomer-type Kalsi-brand rotary shaft seals. Chapter E2 is currently being revised to illustrate how to use the stacked housing arrangement in high pressure hydraulic swivel sealing, and Chapter C5 is currently being revised to provide additional rotary seal test data. 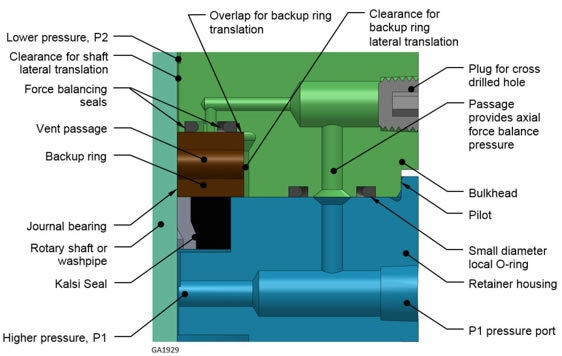 Chapter D17 of our rotary seal handbook has been updated to show an improved floating backup ring arrangement. This new design uses simple stacked housings that are less expensive to manufacture, easier to assemble, and more robust, compared to the original cartridge-based design. This is the most effective way we know to implement high pressure rotary seals.